At the same time as seasonal snow spreads from the polar regions to the midlatitudes each winter, a veil of seasonal ice forms over rivers and lakes. The essential thermodynamics of this process are described in chapter 3. This section expands on this through a summary of several of the main features of lake and river ice. The ice season for rivers and lakes is defined by freeze-up, the moment of the year when continuous ice cover sets in, and breakup, the time when seasonal ice wastes to the point that open water becomes extensive. 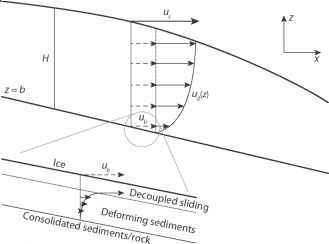 In rivers, ice advection is often factored into the definition; freeze-up may be defined as the time when ice cover becomes immobile, whereas breakup is heralded by the time when ice begins to move downstream. These definitions clearly contain some ambiguity. For instance, "extensive" open water may refer to the first occurrence of visible open water, to the time when travel becomes hazardous on the ice, or to the time when ship navigation becomes possible.